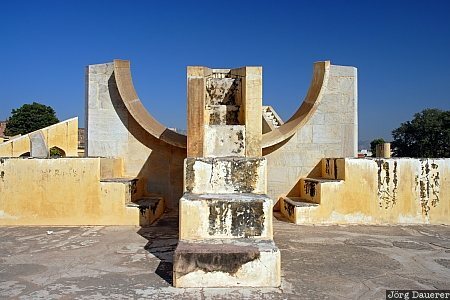 Jantar Mantar is a collection of architectural astronomical instruments, built by Maharaja (Ruler) Jai Singh II in the "Pink City" Jaipur. Jantar Mantar means literally 'calculation instrument'. Jaipur is the capital of Rajasthan in northern India. This photo was taken in the morning of a sunny day in October of 2007. This photo was taken with a digital camera.